While the HomePod was only unveiled five months ago, a team of Apple audio engineers developed several speaker prototypes as a side project over the past five years or so, according to Bloomberg. HomePod was originally a side project cooked up about five years ago by a group of Mac audio engineers, who wanted to create a speaker that sounded better than the ones sold by the likes of Bose, JBL, and Harman Kardon. Side projects aren't uncommon at Apple, where employees are encouraged to follow their muse so long as their day jobs come first. 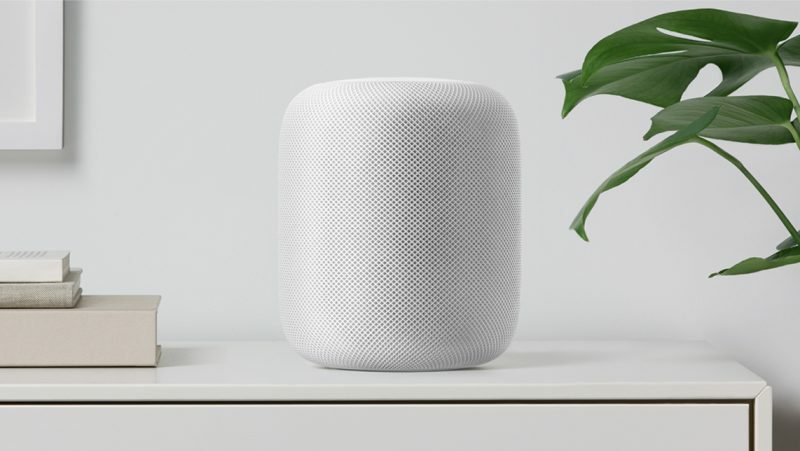 The report claims one of the prototypes stood three feet tall, roughly five times as tall as the current HomePod, and was equipped with dozens of speakers. Another supposedly looked like a flat panel with a mesh screen on the front. The side project was reportedly canceled and revived several times. It wasn't until 2014 that development of the speaker began to ramp up within Apple's accessories division, which also worked on the wireless AirPods. Apple's focus was on creating a speaker with premium sound quality through the use of beam-forming speaker technology. The report claims Apple tested many variations of the speaker in specially designed audio chambers. That same year, the report adds that Apple engineers were "blindsided" when Amazon launched its Echo speaker integrated with its voice-activated personal assistant Alexa, which is considered a hit with customers. The Apple engineers jokingly accused one another of leaking details of their project to Amazon, then bought Echos so they could take them apart and see how they were put together. They quickly deemed the Echo’s sound quality inferior and got back to work building a better speaker. Despite the Echo launching, Apple has maintained its focus on the HomePod being a high-quality speaker, which is exactly how Apple's marketing chief Phil Schiller positioned the product at its Worldwide Developers Conference in June. The Siri team was told that the HomePod was about music and quality sound, one of the people said. Yes, the speaker would be voice-activated but it wouldn't be positioned as a personal assistant. As of this year, the report claims the HomePod was just one of four or five areas that Apple's Siri team was working on, given the company apparently sees it as more of an accessory than a core product like the iPhone. Given the HomePod will be mostly limited to streaming Apple Music, controlling HomeKit accessories, and sending messages through an iPhone, the report claims Apple will be "playing catchup" with Echo-like devices. Apple could still eventually add features to the HomePod. These might include its own app ecosystem and support for competing music services. Even so, until that happens, Apple will still be playing catchup in a category invented by a company better known for e-commerce than hardware. Apple will be even further behind after it delayed the HomePod's release until early 2018, after originally promising it would launch in December. The delay means the $349 speaker won't be ready in time for the holiday shopping season, which could lead customers to purchase an Echo or Google Home instead. What a bogus article. I smell something foul! Anyone looking back at this can see this. As an engineer, it always annoys me when the scenario in this article happens. Management - Meh, not sure I see the appeal I'll think about it. Management - Oh look! Our competitor is releasing one of those. We have to make one too, ASAP! IDK $350 for a speaker still seems like too much for me. Siri works well enough, but as someone who has a smart system, the extent of my use is turning on or off lights and setting timers when I cook. If I could program Siri to work with commands like hey computer instead of hey Siri, it would honestly be an easier sale. You're missing the point of the HomePod if you think it's about Siri. Apple hardly talked about Siri when announcing the HomePod. They hardly mention it on HomePod webpage too and what it talked about is all related to music. HomePod is all about music. That's the entire focus and purpose of this device. Those comparing it to the Amazon Echo and Google Home are missing the point entirely. It's like comparing a Honda Civic, Porsche 911, and Jeep Wrangler 4x4. They'll all get you from point A to point B, but one is best at offroad, while another is best on the track, and another best at fuel economy. HomePod is all about music. That's the entire focus and purpose of this device. Could you explain this more? If this is the case, and it's a $350 device, I have a receiver that I can connect my phone via Bluetooth and play whatever I have available downloaded or streaming. What's the benefit to me? If you're looking to play music primarily, the HomePod is the best option. Wouldn't a genuine stereo system be better for playing music instead of a single speaker that's attempting to recreate stereo playback? I'm guessing that Apple's software engineers are working frantically to make the HomePod more useful in light of what Amazon, Google and Sonos are doing. Sound quality alone won't cut it. Users are accepting the sound quality from cheap Bluetooth speakers, ear buds and the speakers on our phones. The concept of "stereo" and "sound separation" are almost nonexistent to the masses. While it may not have been about Siri when they started it sure as hell has to be now. I want to put these throughout my house, I want them to play background music and seamlessly switch to surround sound in the applicable rooms where we watch TV. I want them to auto turn on/off as I go from room to room. I think there's a real future in high quality smart audio output devices. This has been something Apple has been in since the resurgence, I really wish it wasn't delayed - maybe end of January? The homepod is DOA because it doesn't know what it wants to be. With siri it could take on Amazon, but those customers care more about price then sound quality. As a good speaker it will have to compete with high end speakers, of which Bose, JBL, and Harman Kardon don't really compete in. Yes those are famous brands, but they are not what audiophiles consider as high end. So what should I tell people? For casual listeners Sonos is good enough sound and it works with Alexa. Even the Echo is good enough and it's an AIO. If they care about premium sound they aren't even having this conversation because they will buy what matches their existing sound, or they want each component separate. Doesn't anybody remember the iPod HiFi?